Peyton Manning did not look right today. Maybe it was his vague thigh injury, surgically repaired neck, or some other ailment, but his throws were inaccurate and rough. 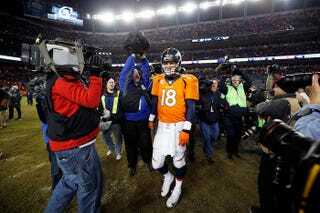 Manning barely completed half of his passes, finishing 26 of 46 with one touchdown and 211 passing yards. The Colts go to the AFC championship game with their 24-13 win, and the Broncos figure out what's next. Denver could lose a lot this offseason. This morning, Jay Glazer reported that head coach John Fox could leave—whether by resignation or firing, Glazer didn't specify—if the Broncos lost to the Colts today. Additionally, offensive coordinator Adam Gase and defensive coordinator Jack Del Rio are both being courted for head coaching gigs around the league. Impending free agents could also drain the team of talent. Wide receiver Demaryius Thomas and tight end Julius Thomas need new contracts. Wes Welker, defensive tackle Terrance Knighton, safety Rahim Moore, and others could leave for more lucrative deals, too. Yeah my mindset right now is just disappointment after today's game. Dave Logan asked me about it after the game, and like I said, I didn't have a great answer for him. So I'm disappointed. I kind of need to process this game and we'll meet tomorrow. I need to process this game. This entire project was built around Manning, and a short but enticing window to win a Super Bowl. Pieces are already loose, and if Manning chooses to step away, the whole touchdown factory might need to be demolished.